Studying abroad for a year gives students the opportunity to experience joy, excitement, and a sense of accomplishment they cannot feel no matter how much knowledge they gain in the classroom in Japan, as well as the opportunity to develop a broad perspective and international view to become capable of playing an active part in the world. Each student has his/her own study abroad stories, which may not always be fun stories. Obstacles such as keeping up in class, feeling homesick, having trouble with roommates, or not enjoying the food... 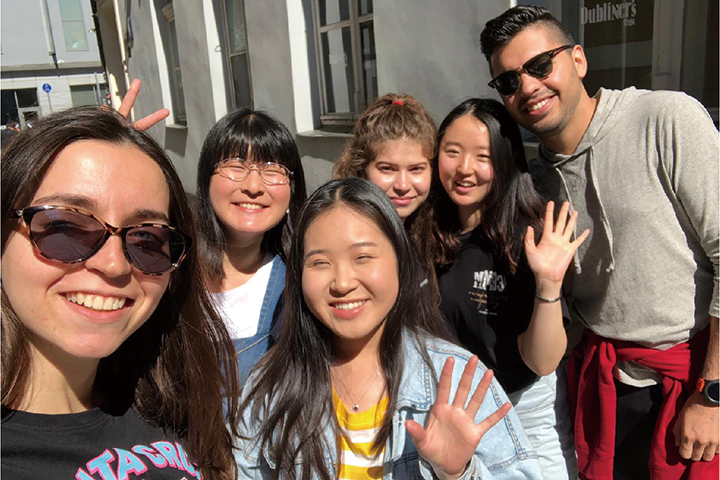 However, by overcoming difficulties, using foreign languages, making friends with people from various countries and spending a year experiencing different cultures, students learn what it feels like to be on the other side of the world and discover their new selves. Study abroad gives you a great opportunity to realize how strong you have grown. Make the year you spend abroad your asset to become the person you want to be. Although the time of study abroad varies from student to student, many students depart during the period from the winter of their second year to the fall of their third year. As of April 1, 2018, we formed partnerships with 195 universities in 50 countries and regions. We will continue to expand the network of partner universities to allow students to study the fields of their choice in countries where they wish to spend their year abroad. *Students may not be able to study in the countries or universities of their choice due to factors such as their grades and circumstances of the partner universities. Many of you may associate study abroad with expensive tuition fees and complicated procedures, but for Akita International University's exchange program, since students pay a tuition fee at the University, they are exempt from paying at the universities they study at during their year abroad (except for some universities. Students are responsible for paying for accommodation, food, travel, insurance, etc.). The exchange program is a system whereby we send a student to a partner university for a year in exchange for accepting a student from the same partner university. To ensure that our students feel comfortable going abroad, we provide detailed support before and during their year abroad including provision of information and assistance in solving problems. In addition to learning languages, our study abroad program is designed for students to study in specialized courses and gain credits at universities they study at. Therefore, they need to have a certain level of English and meet grade requirements to be able to study abroad. That is why the experience they gain during study abroad has significant value. Students also consult with their academic advisors before departure to decide which courses to take at the universities they are going to attend based on their fields of interest and future plans. They earn credits required for graduation by completing those courses with grades established by the University. This credit recognition system allows them to finish their studies in 4 years including the year spent abroad. AIU has Partner Universities all over the world. Details about International Partner Universities are available in the following webpage.